Paul Wegener. Lyda Salmonova. Hans Sturm. Lothar Muthel. Drama. 16th Century. Classics. Mythology. Silent. Horror. Art House. Recommended. Guardian 1000 Must See (2007). Historical. This classic piece of early silent cinema is noted not merely for its dramatic camerawork and cast of thousands but also for its contribution as a cinematic template, particularly in the genre of horror. 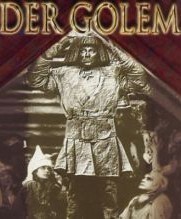 Set in 16th Century Prague, a monstrous creature of Jewish myth is unleashed by a Rabbi to save his people from anti-Semitic legislation; unfortunately for all concerned The Golem's taste for destruction is not sated by the demands of his master, and so begins an unstoppable rampage.